This paper describes a control algorithm that optimises the distribution of joint torques of a polyarticulted robot while performing obstacle clearance of a large step. 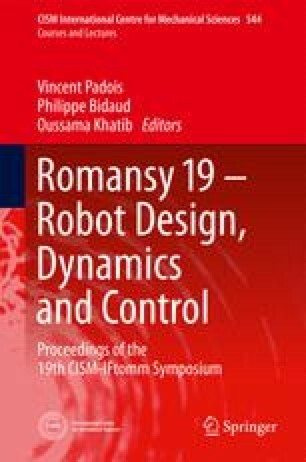 In this work, a special class of polyarticulted locomotion systems known as hybrid wheellegged robots is considered. This type of system is usually redundantly actuated, involving internal forces that could be exploited to improve the tipover stability and the traction forces needed to address more challenging obstacles. The proposed algorithm is based on the forces distribution model including internal forces. Its objective is to optimize a criterion representing the maximum allowable disturbance while respecting the frictional contact conditions. The performance of this controller is evaluated in simulation.